We’d love your help. 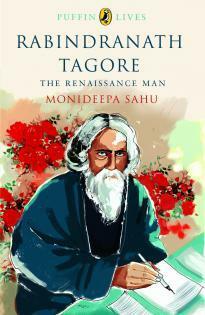 Let us know what’s wrong with this preview of Rabindranath Tagore by Monideepa Sahu. I have spent my days in stringing and in unstringing my instrument.’ - Gitanjali Born in 1861 in one of the foremost families of Bengal, Little Rabi grew up to become a great nationalist, a gifted writer, a talented artist, a brilliant visionary and a reformer of education. He was also Asia’s first Nobel Laureate. Hi The song that I came to sing remains unsung to this day. I have spent my days in stringing and in unstringing my instrument.’ - Gitanjali Born in 1861 in one of the foremost families of Bengal, Little Rabi grew up to become a great nationalist, a gifted writer, a talented artist, a brilliant visionary and a reformer of education. He was also Asia’s first Nobel Laureate. His contribution to India’s Freedom Movement is forever immortalized in Jana Gana Mana, a song he wrote to inspire the nation. This wonderfully insightful biography, rich in anecdotes and little-known facts, brings alive this legendary figure to contemporary readers. Monideepa Sahu vividly recounts Rabindranth’s experiences at school that helped to formulate his vision of Shantiniketan. She also traces the evolution of his poetry from schoolboy rhymes in dog-eared notebooks to universally loved poetry, prose, novels and short stories. To ask other readers questions about Rabindranath Tagore, please sign up. Monideepa Sahu has brought alive the life of Nobel Laureate Rabindranath Tagore through interesting anecdotes and events, which make this book very interesting to read. This is a wonderful biography that carries the reader through a whole sweep of history. To tell the truth, I have never been crazy about Tagore. I love Rabindra Sangeet, but have only read "Gitanjali" and a few of his stories (including, of course, The Cabuliwallah). Though I quite enjoyed them, I felt he was a bit overrated, perhaps because he was one of the few Indians writing in English in his time. Monideepa Sahu's biography really brought home to me what an extraordinary person, what a visi This is a wonderful biography that carries the reader through a whole sweep of history. To tell the truth, I have never been crazy about Tagore. I love Rabindra Sangeet, but have only read "Gitanjali" and a few of his stories (including, of course, The Cabuliwallah). Though I quite enjoyed them, I felt he was a bit overrated, perhaps because he was one of the few Indians writing in English in his time. Monideepa Sahu's biography really brought home to me what an extraordinary person, what a visionary he was, and how he actually lived his vision instead of just sitting on his high horse and talking about it. Maybe I was just too crass in my youth to discern all that in his writing, must reread some time. The tone and language of this biography are just right for young readers, being chatty and friendly, never talking down or preachy. The author skilfully recreates the atmosphere of Kolkata in the latter half of the 19th century and in Tagore's family home, Thakurbari. The simplicity and idealism of the family are touching, and their broad-minded patriotism is inspiring. The setting up of the school at Santiniketan and later Vishwa Bharati seems such a natural and commonsensical process, one wonders why education has become such a complicated business today. One thing I found intriguing is the way the narrative tends to anticipate future events, rather than following a strict chronology. For instance, when describing young Rabi's relationship with his sister-in-law, 'Notun Bouthan', in an early chapter, we are told how she died young, how deeply her death affected Rabi and how he dedicated many poems to her memory. In due course, in a much later chapter, there is only a brief mention of Notun Bouthan committing suicide for reasons that were never known. There is a lot of this going back and forth, which gives the book its conversational style and somehow enriches it. Monideepa -- if you are reading this, I'd love to hear what made you adopt this approach. Thoroughly enjoyed the book. Such a precise, concise biography of such an interesting man! I knew quite a bit about him, but reading this book told me so much more, put everything into context, and threw new light on various aspects of Tagore, his life and his works. The first chapter was slightly bumpy, perhaps because the author because had to string together several little incidents. But from the second chapter, the flow was very good, seamless... she has brought in the incidents and informati Thoroughly enjoyed the book. Such a precise, concise biography of such an interesting man! I knew quite a bit about him, but reading this book told me so much more, put everything into context, and threw new light on various aspects of Tagore, his life and his works. The first chapter was slightly bumpy, perhaps because the author because had to string together several little incidents. But from the second chapter, the flow was very good, seamless... she has brought in the incidents and information at the right time. This must have involved a whole lot of research, writing and rewriting! No mean achievement this! The last couple of chapters, with the focus on his philosophy and nationalism, was really enlightening. She has simply described the life of Rabindranath Tagore in this book. Very simple but elaborately described. Takes us to the Tagore Era. Loved every page of it.